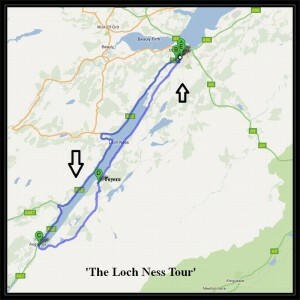 Circular route around the world famous Loch Ness. Who knows you might even get to see ‘Nessie’. Don’t forget to take your camera on this ride as there are some famous and spectacular views along this cycle ride. I would not recommend this ride for the beginner as not only is it an approximate 68 mile ride and undulating on the north side of the loch, but as you return up the southern side of Loch Ness you will encounter some severe climbs, but the views from the top are well worth the effort. 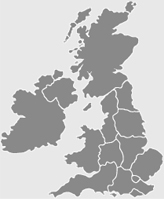 The letters in brackets represent the points given on the map for guidance. Cycle hire is available in Inverness from Monster Bike, Canal Road, Inverness or Highland Bikes, Telford Street, Inverness. 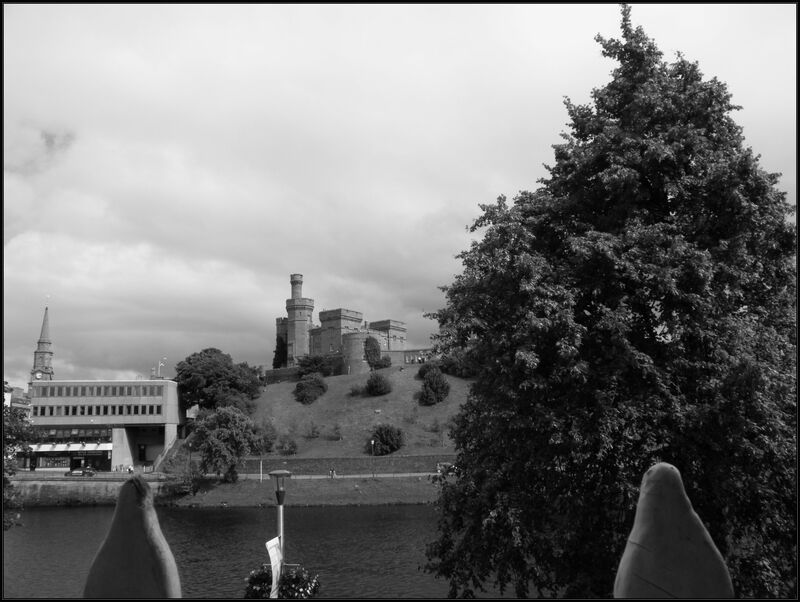 We started our route from the base of the castle at Inverness but as it is a circular route around the loch you can start from any point along the cycle route given. From Castle Street at the base of the castle cycle along Young Street across the bridge over to the other side of the river. On reaching the other side of the river you turn immediate left along Bishop’s Road, Ness Walk and Bught Road respectively. 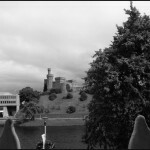 Here you will pass some of the main hotels in Inverness with their river views. As you reach Bught Road there is a sharp right hand bend in the road away from the river, carry on following the road around the bend. see the terminal for boarding the cruises along the loch. Turn left onto the A82 towards Dunain Park and Fort Augustus. Carry on cycling along the A82. You will find that for the first part of your ride along this road you will move away from the waterside but rejoin the side of Loch Ness after about 4 miles. As you cycle along the edge of the loch on the A82 you will pass through the villages of Dochgarroch and Lairgmore before rounding a sharp hairpin bend in the road which will bring you back to the water side at the world famous Urqhart Castle. The present Urqhart Castle was believed to have been built in the 13th century on the same site as people have believed to have lived for over 4000 years. It is thought that a castle has stood on this site since the 6th century in the times of St Columba. Continue cycling along the side of the loch on the A82 towards Portclair and Fort Augustus. On reaching Fort Augustus you can stop and enjoy the surroundings as this is just under your half way point and ahead of you are some serious hill climbs. At Fort Augustus Loch Ness meets the start of the Caledonian Canal where there is a long series of canal locks and The Caledonian Canal Heritage Centre amongst other attractions. On setting off from Fort Augustus you leave the A82 and bear left onto the B862 (C) following the side of the loch towards Glendoebeg and as you start to leave the water side and climb up towards the ridge ahead you will pass the small Loch Tarff on your left. Carry on following the B862 all the way up to the top of the ridge where you will enjoy some spectacular views of the area. Carry on cycling down the ridge along the B862 through Whitebridge and towards Foyers (D). At Foyers you can stop and experience the spectacular site of Foyers Falls said to reach a height of 1000ft at its highest point. final approach to Inverness along Dores Road. Which eventually runs into Island Bank Road and Castle Road at Inverness (E). Hope you enjoy the cycle ride although it can be a tough one in places its definitely one of those rides you can say to your mates down the pub you have done as an achievement. There are plenty of establishments to stop for refreshments on the way, although there is not much other than the scenery along the ridge overlooking Loch Ness on the south side of the loch until you descend. Inverness is said to be the capital of ‘The Highlands’ and is a bustling city with plenty of shops, cafes, restaurants and tourists attractions for you to explore at the end of your cycle ride.